The irony of Last Action Hero is that many of the best jokes work better in hindsight; however, most of the jokes are so dated that it is hard to imagine the film cultivating new fans. It’s hard to truly quantify the intended impact of 1993’s Last Action Hero, as compared to what actually happened, from 21 years after its release. Now that Last Action Hero is old enough to drink legally, Hollywood and popular movies have changed considerably from the day this film debuted. 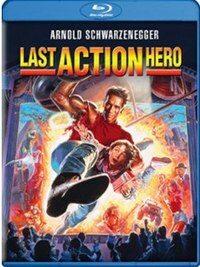 To put things into perspective, this action/ comedy/ fantasy was an absolutely “Can’t Lose” proposition for Hollywood, featuring the biggest star in the world at the time, Arnold Schwarzenegger (who also produced), and a director named John McTiernan, who had a proven track record with action blockbusters such as Predator (1987), Die Hard (1988) and The Hunt for Red October (1990). A marketing blitz accompanied the film, including a giant, inflatable Schwarzenegger in New York and a fast food tie-in with Burger King. So confident was Columbia Pictures in their new hit-to-be that they released Last Action Hero just a week after the mega-hit Jurassic Park. However, the “Can’t Lose” blockbuster did manage to come up short. It was critically lambasted, and although Last Action Hero did make much more than its $85 million budget back counting foreign receipts, the domestic box office topped out at just over $50 million. What went wrong? All the ingredients for not only a big-budget action thriller were there; throw in the surreal spoof twist and surely this was going to be a cool comedy to boot. Given all of this, one might expect a self-aware, star-studded parody of the excesses of late '80s and early '90s action flicks with some of the top purveyors of such movies not only in on the joke, but serving it up to their hungry audience on a silver platter. Imagine a machine-gun wielding version of Robert Altman’s The Player (1992). And it could have been just that. Here we have a young boy named Danny (Austin O’Brien) who is an avid and devoted action movie fan, specifically of the (fictional) Arnold Schwarzenegger action series “Jack Slater” (your typical late 80s – early 90s action saga with recurring characters). Everything remains firmly in Danny’s fantasies (including a somewhat funny daydream version of 1948’s Hamlet with Lawrence Olivier replaced with a cigar-chomping Schwarzenegger) until Danny is given a magic golden ticket which he uses to attend a pre-screening of Jack Slater IV. The theater’s aging projectionist Nick (Robert Prosky) is a friend of Danny’s, you see, so he not only gives him the ticket (given to Nick by Harry Houdini himself), but he also allows him to preview the entire film solo in an empty theater. This ticket was no mere prop, however, and Danny is soon thrust into the action of Jack Slater IV and is forced to (gleefully) team up with his hero to help solve the murder of Slater’s “favorite second cousin” (played by Art Carney) and save the day against criminals played by Anthony Quinn and Charles Dance. All of the excessive elements of the films Last Action Hero purports to parody are right there in Jack Slater IV. The explosions, high death toll, over-the-top villains, nick-of-time rescues, bombastic music, “surprise” plot twists, convenient plot holes, good guys always winning and ridiculously bad one liner puns all become ingredients in the film-within-a-film. Sadly, this is also where Last Action Hero loses the audience because such clichés not only permeate the fictional film but the movie itself. It would be easy to dismiss Last Action Hero as being saved from parodyhood by its filmmakers who still served to make plenty of bucks from the genre; however, this isn’t the case. Schwarzenegger, the executive producer, has no qualms here about making fun of himself as an actor; not only in the action films he became famous for, but as the person he was in the press. When the film shifts back to “the real world” we see a humorously buffoonish version of Schwarzenegger whom even Jack Slater can’t stand. Humorously, the fictional Slater fails to correctly pronounce the last name of the star who portrays him and, upon meeting his real-world counterpart, finds him insufferable. One of the funnier moments in the film involves then-wife Maria Shriver criticizing the future California Governor for his constant self-promotion, which he does in the film anyway. The constant appearance of action stars (playing themselves) in the “real world” also helps to demonstrate exactly what McTiernan and company are trying to do here. Sadly, these divergent puzzle pieces do not often fit together terribly well, in spite of their potential. For example, Last Action Hero seems to never quite understand what its target audience is or should be. Often the film seems to be shooting for a fun kids’ movie vibe, fueled by young teenage fantasies. Other times Last Action Hero does seem to be attempting the mature and intelligent parody that The Player succeeded so well at. Still other times Last Action Hero seems to be aping Ralph Bakshi’s Cool World (1992) with its dual world scenario and the dangers posed to both sides of the screen. Surely audiences of the day could relate to the comedy of seeing Sylvester Stallone (as opposed to Schwarzenegger) on an advertisement for Terminator 2 (1991). Even the ridiculous concept of re-writing Hamlet as a Schwarzenegger vehicle fits well with the film's comedy—even managing to work on multiple levels, depending on the audience member. Then again, when the golden ticket manages to bring to life characters from (and, no I’m not kidding here) Ingmar Bergman’s The Seventh Seal (1957), it’s hard to imagine much of the usual audience of young action fans the marketing targeted getting this concept at all. Part of this confusion and missing-of-the-mark may come from the fact that so many of the action films that Last Action Hero’s original screenplay (by Zakk Penn and Adam Leff) attempted to parody were written by one Shane Black. When the studio asked for script rewrites they brought on two writers, David Arnott and… yes, Shane Black himself. While Black’s work is surely to be commended in many ways (he went on to direct and co-write the recent action blockbuster Iron Man 3 from 2013), lending his pen to a spoof of his own work is an irony that could be best appreciated within the fictional universe of Last Action Hero itself. For all its flaws, there are still moments of brilliance and a lot of good times to be found in Last Action Hero. Sure, Schwarzenegger gives a typically robotic performance, but veteran screen villains Charles Dance and Tom Noonan are very fine in this film, especially in the inspired exploration of the two worlds. This occasional quality both explains the large cult following this film has amassed over the years and makes it all the more disappointing when Last Action Hero collapses under its own weight. Many within this cult following might be clamoring for a deluxe Blu-ray release of their favorite film. Sadly, Mill Creek doesn’t do deluxe releases, and the 2014 Blu-Ray (which admittedly does look and sound good) is as bare bones as it gets, offering no extras of any kind. (Pop the disc in and you won’t even see a menu… the film starts right away). Thus, neither the film’s makers, nor apologists offer any defense of this oft-reviled piece of comical cinema. In another case of Arnold Schwarzenegger’s career “pumping irony”, many of the more well-realized jokes in the film work better in hindsight without the weight of a blockbuster summer and negative word of mouth burdening a fun film. Further, as film has changed, many of the standard action tropes seem even funnier today. However, these elements also come off as so very dated that it’s difficult to imagine Last Action Hero earning very many new fans. Perhaps that will change and a new generation might embrace Last Action Hero as the penultimate of a cycle of over-the-top films that led the genre to become a parody of itself before it changed into something more realistic. There is precedent for this. The same happened to classic horror when Universal Studios’ famous Monster Movies were served up in the film Abbot and Costello meet Frankenstein (1948) which, incidentally, was made and released by Universal Studios. Until that (improbable) time comes, perhaps the bare bones Mill Creek release of Last Action Hero is all that is warranted by the public.